Maine is a state in the New England region of the northeastern United States, bordered by the Atlantic Ocean to the east and south, New Hampshire to the west, and the Canadian provinces of Quebec to the northwest and New Brunswick to the northeast. Maine is both the northernmost and easternmost portion of New England. It is known for its scenery—its jagged, mostly rocky coastline, its low, rolling mountains, its heavily forested interior and picturesque waterways—as well as for its seafood cuisine, especially lobsters and clams. It has the 40th largest population in the United States. Maine’s major industries include agriculture, tourism, and fishing. 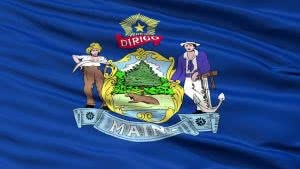 Maine requires corporations to have names that can’t be confused with any existing entity name, registered or reserved name, assumed name or mark on record with the Secretary of State. Company Express will research your company name to make sure it meets Maine’s standards. Turnaround time: About 12-25 business days. 2-3 days expedited filing is available for an additional fee. Minimum number: A corporation is required to have a president and a treasurer. Corporations must have one or more directors. Time to file: Annual report should be filed on or before June 1. Signatures: Persons authorized by the corporation may sign annual reports. Emailed or faxed signatures are not accepted. Maine requires Limited Liability Companies to have names that can’t be confused with any existing entity name, registered or reserved name, assumed name or mark. Company Express will research your company name to make sure it meets Maine’s standards. Required documents: Articles of Organization filed with Secretary of State office. Turnaround timeAbout 12-25 business days. 2-3 business days expedited filings are available for an additional fee. LLC’s principal office have to be located inside the state. Local Registered Agent is also required. Time to file: Annual report must be filed on or before June 1. Signatures: An authorized person may sign reports. Emailed or faxed signatures are not accepted.